The AimTrade Expert Advisor is nothing more than an iron working out of average price mathematics. 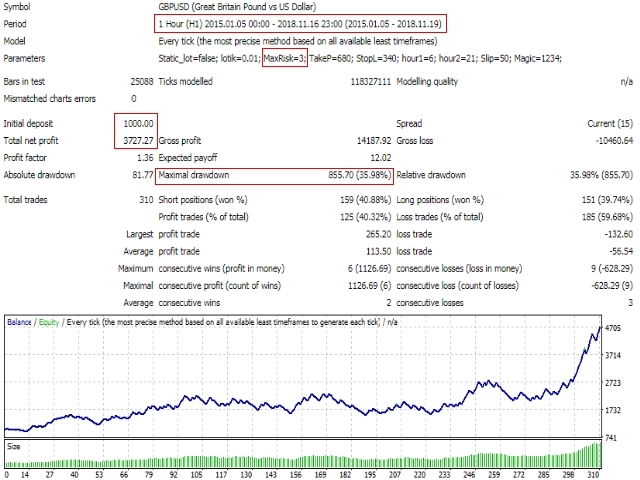 A very simple and reliable code, which incorporates a profitable strategy for the GBP/USD currency pair, H1. For other tools you need to select individual settings. Does not use: martingale, grid, scalping, arbitration. Transactions are not frequent, about 5-7 pieces per month. The robot is focused on long-term results, so profitability is better measured by quarters. From 2015 to November 2018, the adviser made a profit of 470% with a risk per transaction of 3%, the drawdown on the account was 36%. The rest of the figures look at the screenshot below. Already I am working on improving the trading expert, open to new ideas and wishes. All questions and problems can be left in the "Comments" section. If you need assistance in setting up a VPS and installing an expert, please contact us. Static lot - true\false. If true, the lot will be static. It must be specified in the item "Lot". Lot - 0.01. Permanent lot, works only if "Static lot is true". Percent of loss - risk per trade as a percentage, works only if "Static lot is false." Start time - start time. The default is GMT. End time - end time of work. The default is GMT. Magic - individual number for transactions.